If you’re a late summer or fall bride, the months of July and August are prime for your summer bridal shower. For an exciting day of celebrating your wedding with your closest family and friends, you’ll undoubtedly need a gorgeous summer bridal shower dress for the occasion. Aside from your wedding dress, you need a handful of looks—from your engagement party to your rehearsal dinner—as a bride-to-be and your bridal shower dress is a moment where you can go ultra-feminine with your look. 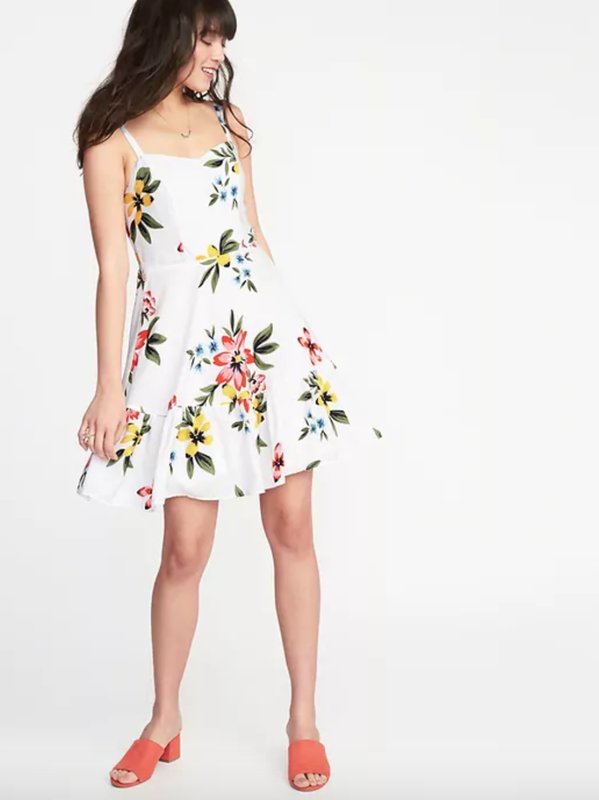 And while gorgeous bridal shower dresses are available year-round, summer tends to have an especially great assortment at the ready from little white dresses to cheerful floral prints and festive colors. For the traditional bride, a lacy white dress is classic and so stunning. You can go super simple with a traditional silhouette like a sheath or A-line number or embrace the season’s asymmetrical details like a one-shoulder neckline or high-low hem. If you’re the more casual type but still want to wear white, bohemian dresses fit for warm weather are perfect—a lace-trimmed mini, breezy cotton midi or easy linen dress is very laid-back bridal chic—puffy sleeves and vintage-style wraps are especially of-the-moment in effortless-looking fabrics and silhouettes. Modern brides will love a white dress with a bit of black detail for a bride-to-be vibe that’s a tad more directional. Floral prints and polka dots are lovely if you’re in the mood for a little color or print whether you go for a barely-there motif or a splashy pattern. Both feel feminine and romantic without being overtly bridal. Heck, you may even want to scoop up a few! The best part about a summer bridal shower dress is that, more often than not, it can be a style you wear again and again after the celebration. For summer, we know you have a multitude of events on the calendar that go beyond your bridal festivities. Whether you’re looking for a bridal shower dress that’s classic, bohemian or fashion-forward, ahead, we’ve rounded up 34 options from ultra-affordable styles to designer versions. Get inspired!